A lot has happened since our last post on March 10, namely, several killing freeze nights, one in particular down to between 24 and 26 F.
Every fig we had taken out of the winter grow room project and out of hibernation in the garage were left out, on purpose with a purpose, to see what would survive. 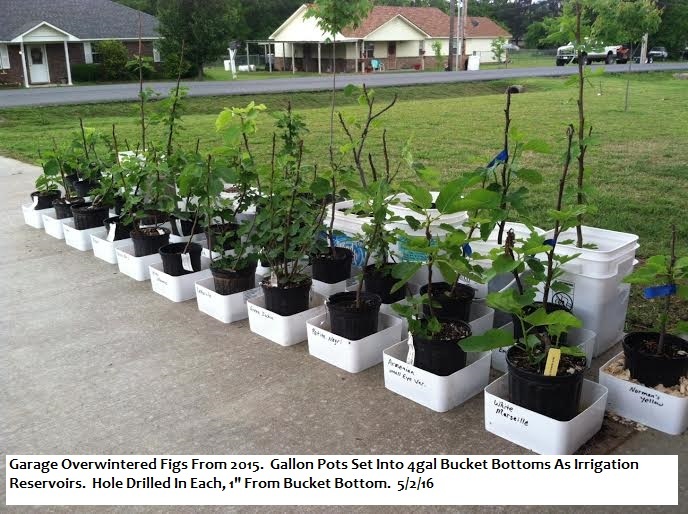 We simply don't want any wimpy fig varieties. Out of all our varieties, one stands alone as the cold hardy champ, Stella. She never lost a leaf and kept two of her three breba figs on through it all, never once slowing down or stunting, even with thick, hard frosty ice covering our car, right next to the driveway figs on several nights. That photo was taken 4/12/16. Stella was put in-ground a few weeks ago where she continues to grow and enlarge her breba's. Honorable mention goes to Green Ischia, Armenian (small eye var), Black Jack and Texas BA-1 which all kept some leaves. Every other variety suffered partial to total die back of leaves and stem to the ground but all have either pushed out new buds from lower growth that didn't die or have pushed out new shoots from under the soil surface. We did not lose a single plant to cold and only one was a loss in the garage over winter, a small VdB in a terra cotta pot that most certainly dried out from being in a porous container and under-watered. So, what the heck are we going to do with all these figs that just won't die? LOL! I don't know who created that but I love it! 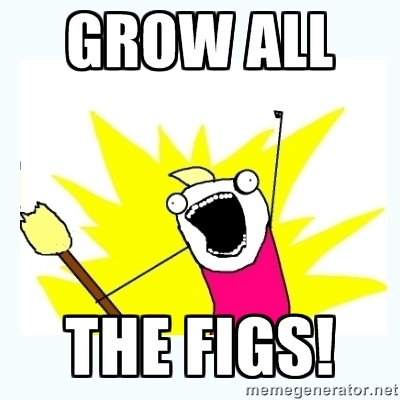 We will grow all the figs! Since pushing the boundaries of what figs will survive, we sacrificed a lot of figs we likely would have gotten had we protected all the trees, but we learned in the process. Figs are tougher than some would lead to believe. Now an update on the fig cuttings we overwintered in compost, in the gallon sized, economy Root Pouch Grow Bags on the back patio and front porch. They too suffered from quite a long spell of cold to cool nights this Spring and are just now really starting to push out buds and leaves. So far the count off the back patio is fourteen each of Hardy Chicago and Sister Madeline's Green Greek, with one Jim Dandy that has already been given to my friend who discovered the mother tree. Hope we get a few more of those! From the front porch grow bags surviving. 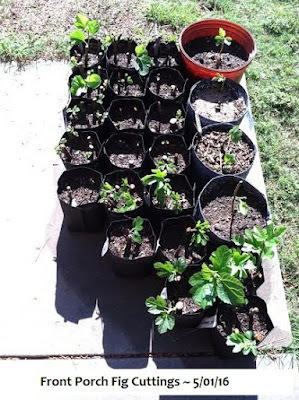 Black Madeira and Galicia Negra which have already been up-potted and set elsewhere, Vista, Valley Black, Unk Sheepshead, Unk Carini, Nero 600 M, Kenny Blackbird Local Green, IGO Yellow, Unk J. Spruill, Texas White Everbear. LSU Tiger, Sal's, Sicilian Red. Safrawi and Unk Durbrow Seedless, still under the porch, look to bust buds any day now. Many of these we have multiples of since some bags were loaded with more than one cutting. Newly rooted cuttings are sensitive though, time will show the true survivors. 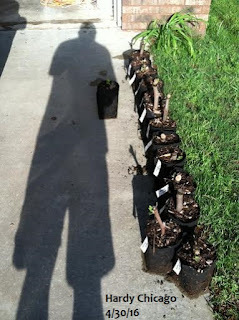 I'm pretty confident we can consider the rooting of fig cuttings, outdoors over winter, a success. For the expense and effort involved, not much, we have already gained many new fig starts with surely more to come. 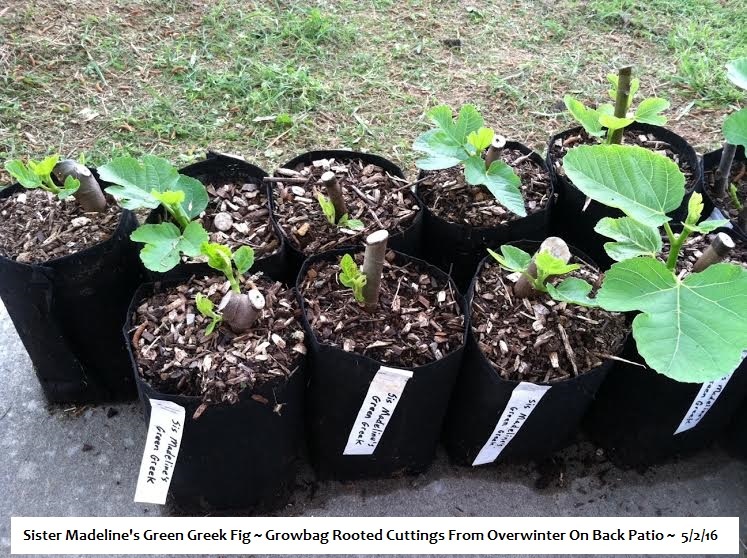 We simply stuck a bunch of cuttings into a bunch of growbags, in compost and let nature have at it, except for keeping the front porch bags moist with a garden hose sprayer about once per week if dry at finger depth..
All the fig trees which were in white, 5gal pails that overwintered in the garage were set in-ground, along the South border of the yard and in the back yard in neat rows. The bucket bottoms were removed and the buckets were buried to about 2/3 deep. This leaves a 1/3 above ground level so we have a small "drier" zone in case of heavy rain and ground saturation, which we have had and all seem to be doing fine, having recovered from freeze and putting out new growth. 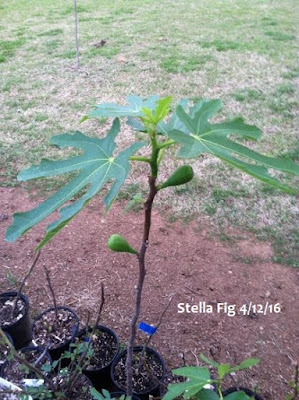 We still have many fig trees that overwintered in the garage in plastic, gallon size trade pots and other various shape containers. 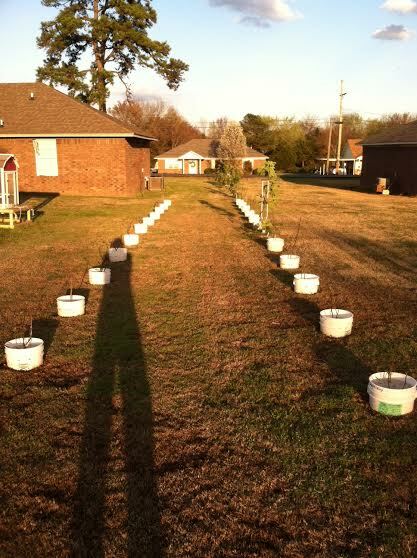 The ones in gallon pots, we recycled the winter grow room bucket bottoms to become irrigation reservoirs. A drain hole is drilled into each, 1" from the bottom so excess drains out in case of heavy rain. That's about it for now. When some more 5gal pails are acquired, we'll set some more of the driveway figs and other rooted cuttings in-ground, somewhere in the yard. Many will go to friends and other various places where trade deals have been made and promises to keep.